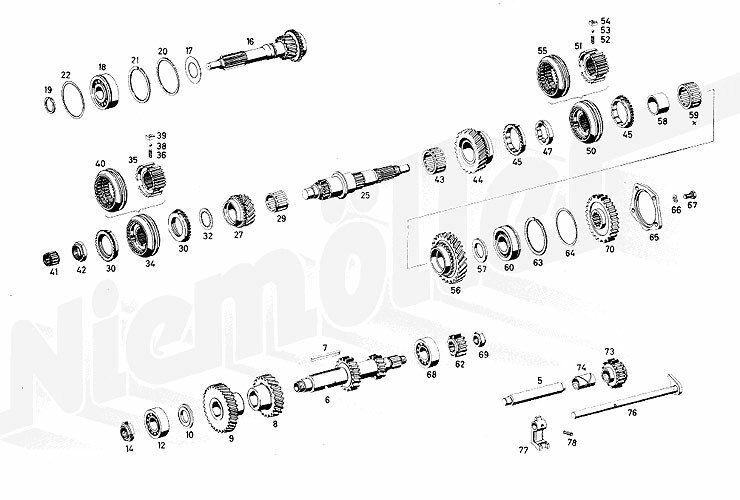 5 F 26 009 return axle a.A. a.A.
6 F 26 010 layshaft a.A. a.A.
0 F 26 011 layshaft a.A. a.A.
7 F 26 012 feather key a.A. a.A.
9 F 26 014 gearwheel, countershaft a.A. a.A.
10 D 26 134 distance washer a.A. a.A.
27 F 26 020 Gear (wheel set) 3rd gear a.A. a.A.
0 F 26 022 needle roller bearings a.A. a.A.
0 F 26 023 needle roller bearings a.A. a.A.
0 F 26 024 needle roller bearings a.A. a.A.
35 D 26 150 Synchronizer for 3rd and 4th gear a.A. a.A.
0 F 26 028 needle roller bearings a.A. a.A.
0 F 26 029 needle roller bearings a.A. a.A.
44 F 26 030 Gearwheel with synchronizing cone 2nd gear a.A. a.A.
47 D 26 156 Thrust washer 4,0mm thick a.A. a.A.
51 F 26 032 synchronizer a.A. a.A.
54 D 26 163 towing arm a.A. a.A.
55 D 26 160 sliding sleeve a.A. a.A.
0 D 26 156 Thrust washer 4,0mm thick a.A. a.A.
56 F 26 033 cogwheel first gear a.A. a.A.
0 F 26 035 Thrust washer u.B. 3.8 mm a.A. a.A.
0 F 26 036 Thrust washer u.B. 3.9 mm a.A. a.A.
0 F 26 037 Thrust Washer u.B. 4.0 mm a.A. a.A.
0 F 26 038 Thrust washer u.B. 4.1 mm a.A. a.A.
0 F 26 039 Thrust washer u.B. 4.2 mm a.A. a.A.
57 D 26 167 Thrust washer 3.8mm thick a.A. a.A.
0 D 26 168 Thrust washer 3.9mm thick a.A. a.A.
0 D 26 169 Thrust washer 4,0mm thick a.A. a.A.
0 D 26 170 Thrust washer 4.1mm thick a.A. a.A.
0 D 26 171 Thrust washer 4,2mm thick a.A. a.A.
62 D 26 172 Return wheel (countershaft) a.A. a.A.
78 D 26 184 clamping sleeve a.A. a.A.